The Old Corner Shop is a beautifully appointed holiday cottage in Berriew. 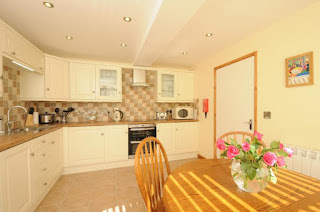 Our accommodation provides a comfortable and homely base from which to explore Powys. Berriew is a picturesque village, with its Tudor style buildings, rural charm and the River Rhiew running through its centre. The village is a short drive from Welshpool and many other attractions. As its name suggests, The Old Corner Shop was once a centrally placed store in the village. It has been re-furbished to a high standard and offers well-appointed accommodation for up to 4 people. Short breaks are available, so whether you are looking for a quick break away with friends or a longer family holiday, we look forward to welcoming you. This stylish and attractive holiday home includes everything you need for an enjoyable holiday. The view from the kitchen and lounge takes in the picturesque village church, while the bedrooms look out over the River Rhiew. An elevated view of the river can be enjoyed from the cottage’s rooftop sundeck, which is accessed through the landing. Berriew is a fantastic place from which to explore Mid-Wales. Within comfortable driving distance you can reach Welshpool, Newtown and Montgomery. Alternatively, you can hop on a bus (there is a route that runs straight past the cottage) or enjoy a bike ride in the local area. Cycle route 81 runs through the village and the Montgomeryshire Canal is roughly 500m away. You will never be short of places to walk or cycle when you stay.